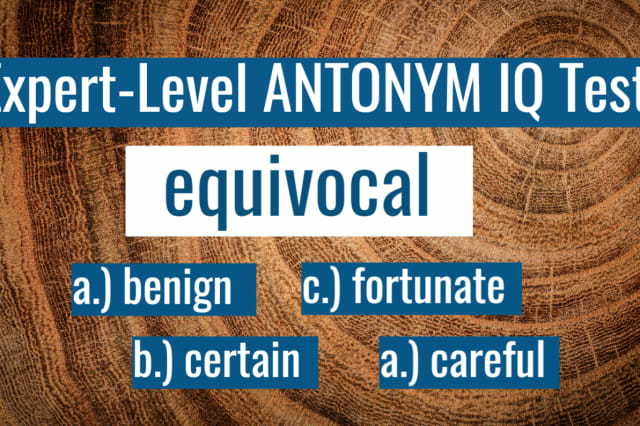 Can You Pass The Hardest Antonym IQ Drill On The Internet? A thesaurus-like knowledge of synonyms is invaluable to any English-speaker, but true mastery of the language comes from the other side of this double-edged sword, as well: Antonyms. We'll show you a word and all you have to do is pick the most accurate antonym to its meaning. Simple, right? Just like with any real test, you won't know if you've passed until the end. Ready? PASS! Your Syntax IQ Is Off The Charts! Fascinating! You possess an innate knowledge of the English language that goes far beyond basic teachings. While some cannot even define the term "antonym" - you thrive on it, and are a walking, talking, writing thesaurus! Not bad! You're definitely not the "I live and breathe syntax" kind, but you certainly paid attention in school and in your daily life. Well done on your use of the English language! Perhaps its for the best you didn't pass this first round - we all need to learn something new each day, right? An antonym is the opposite of something. I.E. if your word in question is 'hard', then an antonym would be 'soft', yes? Synonyms hold the same meaning, while ANTonyms (like an ANTagonist) are the opposite.